I have been meaning to make this since I found it at Fragrant Vanilla Cake. Amy, the writer, is a raw cake genius. Her presentation skills alone make it worth having a look at. One of the lovely things about making raw cakes, is that they often have few ingredients (so are really easy to share from memory). They are also great to make on hot days as there’s no need to turn on the oven. 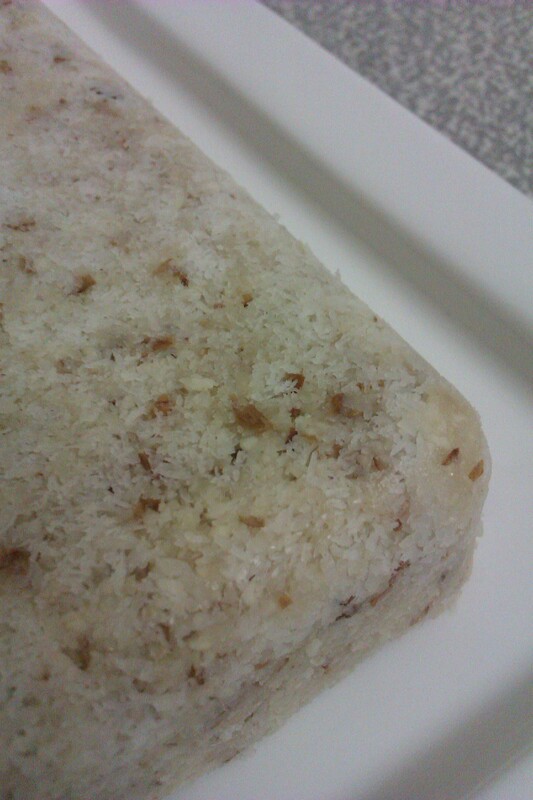 This is gluten free, dairy free, egg free and, if you change the sweetener, vegan. But it’s high in taste. I made this yesterday because my sister came over for dinner. I was going to show you my yellow nutty noodles with broccolini, but it didn’t come out how I wanted it. Ben and my sister liked it, but I want to work on it more before I share it. 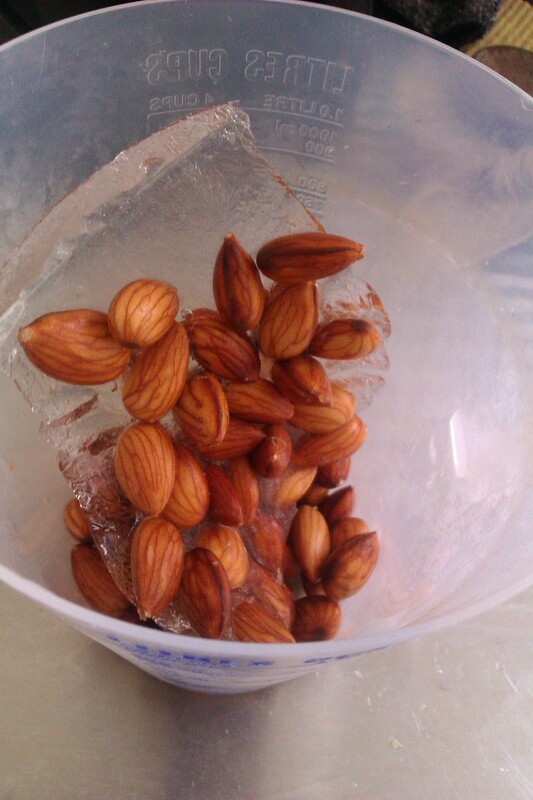 1.5 cups almonds (soaked in water overnight and rinsed) (if you live in a warm area and want to soak your almonds in the fridge, DON’T put them in the section of the fridge that freezes everything [pictured]. Sigh). It’s pretty simple. Chuck it in a food processor and buzz it all up. Scrape down the sides if you need to (which you will need to do at least once to remove the honey from the processor bowl). 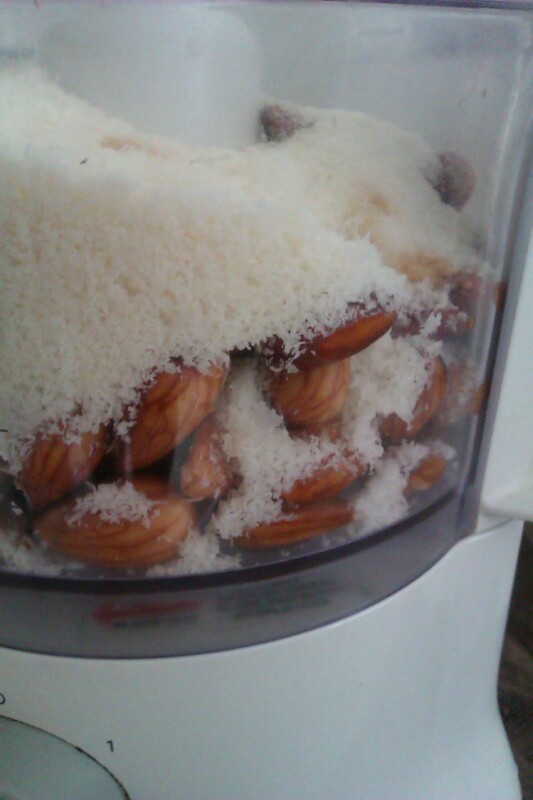 If you have a small food processor, like I do, then you may want to do this in 2-3 batches. I found myself spooning out the less ground up mixture in the top, putting it aside, finishing the part on the bottom, and then swapping it over. I may also halve the recipe next time, as this made a lot of cake. 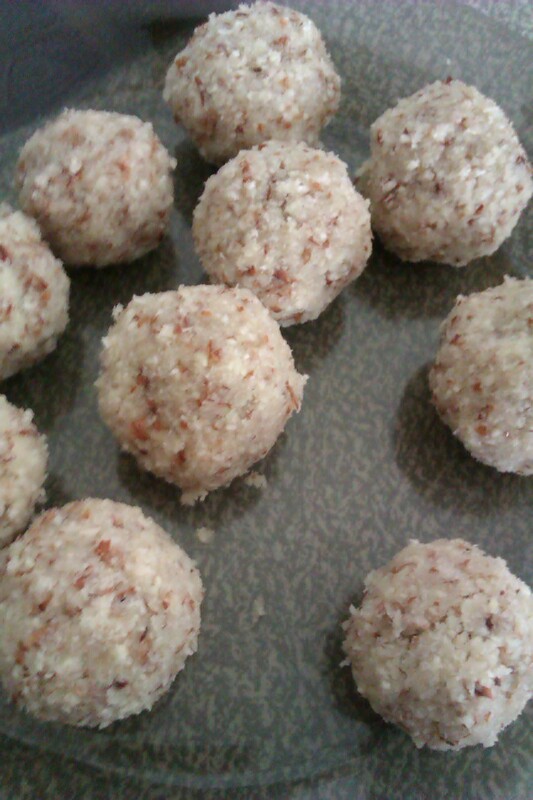 I wanted a fairly flat cake, so I also made cake balls out of some of the mixture. Hmmm. We’ll work on that. To make a cake shape, you need a tin or plastic container. This doesn’t need the over, so just put it in whatever shaped container works for you. I used a plastic container so it could go straight into the fridge without fuss. To make sure it came out again in one piece, I put a tiny amount of veg oil in the container and spread it round, then added a spoon of coconut to the container and shook that around until it “lined” the container, much like one would grease and flour a cake tin. It worked perfectly. Press in as much mixture as you want. Use your hands, a spoon or a glass’s bottom to press in firmly. Chill in the fridge 1 hour+. And the result? Well, I think my excellent photography speaks for itself- it looks like moldy bread’s cousin. 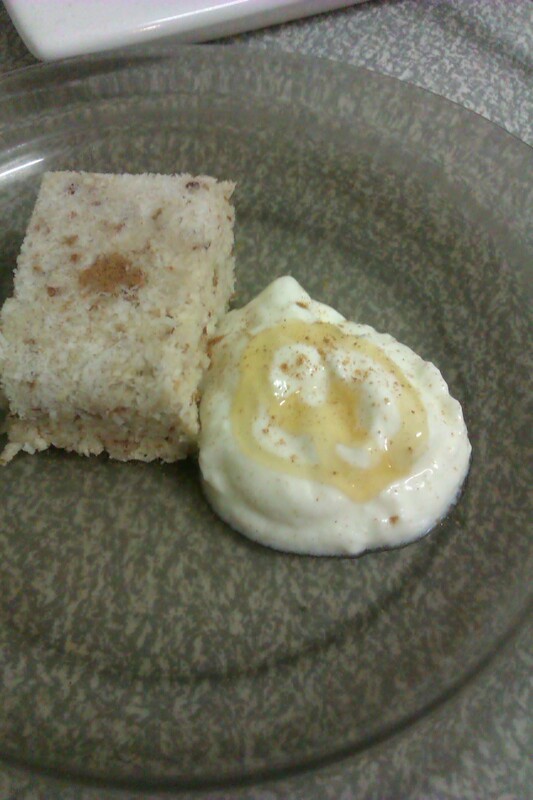 BUT it tastes really good, and we served it with Greek yoghurt, which had a great tang that worked with the dry coconut sweetness. 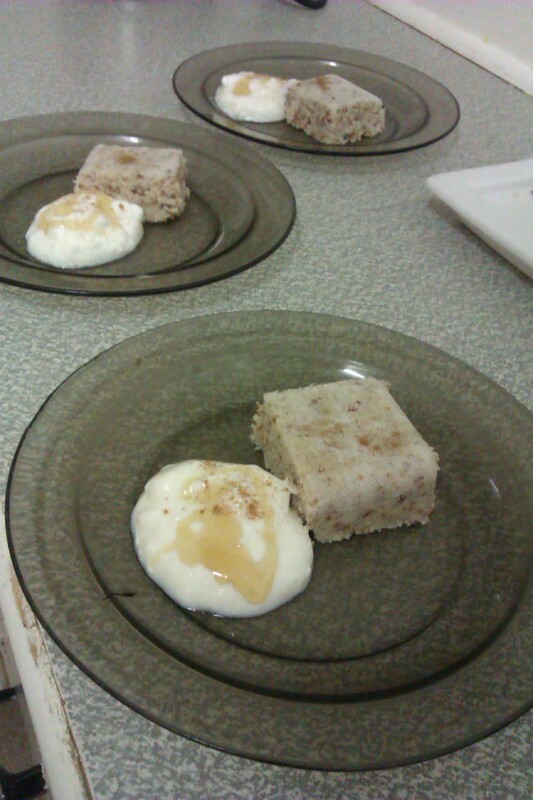 It’s served here with honey and cinnamon as well. I think the brown Pyrex really brings out the flecks of almonds (ok, so I’m working on crockery. This will take time!). Amy at Fragrant Vanilla Cake iced hers with raw cashew icing. If you’d like it to look pretty, I’d try that. In the meantime, I’m eating some of this for breakfast. What? It’s just like muesli.